Monica Kurth is sworn in. The 100th member of the Iowa House was sworn into office today. Democrat Monica Kurth of Davenport won a special election last week. She replaces former State Representative Jim Lykam. Lykam, who is also a Democrat from Davenport, is now a state senator. He won a special election in late December to replace a state senator who died this past fall. Kurth’s family was on hand for the event, including her twin sister. Kurth was an instructor at Scott Community College for more than 20 years. 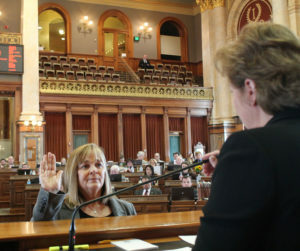 Kurth will begin casting votes later today on a bill that spells out how much more general state aid Iowa’s public school districts will get in the coming year.